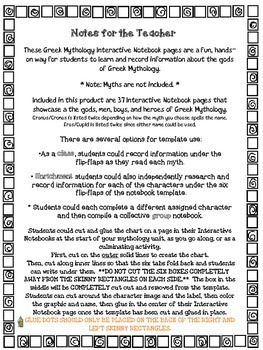 These Greek Mythology Interactive Notebook pages are a fun, hands-on way for students to learn and record information about the gods of Greek Mythology. 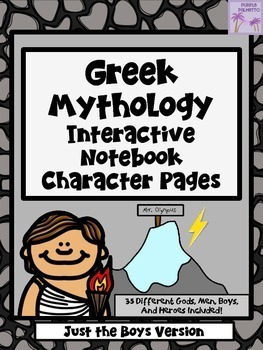 Included in this product are 37 Interactive Notebook pages that showcase the gods, men, boys, and heroes of Greek Mythology. flip-flaps as they read each myth. * Enrichment students could also independently research and record information for each of the characters under the six flip-flaps of the notebook template. * Students could each complete a different assigned character and then compile a collective group notebook. 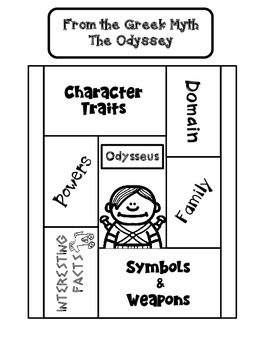 Students could cut and glue the templates on a page in their Interactive Notebooks at the start of your mythology unit, as you go along, or as a culminating activity. Just the Girls and Just the Monsters Versions available too! Mythology Bundle - Six Products in All! Mythology Bundle - Four Awesome Products! 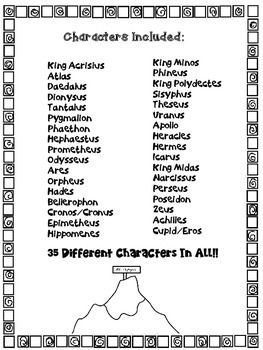 Twelve Labors of Mythology-Fun Activities for your Students! Mythology Memory - Just the Girls! Mythology Memory - Just the Monsters and Creatures! Mythology Memory - Just the Boys! ©2015 Purple Palmetto. Use for a single user. Additional copies must be purchased if you plan to share with others. No part of this resource maybe posted on a blog (personal or commercial), webpage/site, server, or other location that is accessible by multiple people without express written permission from the copyright owner. Violations of this notice are subject to the penalties of the Digital Millennium Copyright Act (DMCA).